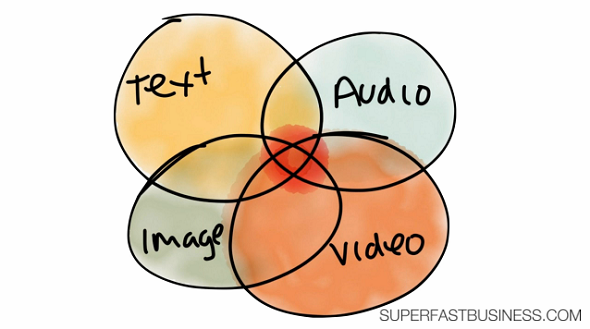 If you can have only one medium for your website, what should you choose? Should you settle on your strengths or consider other factors? Learn what’s the best type of content to post on your website in this episode. What is the best type of media? 00:12 – Video, text or audio? 02:33 – Can you mix it up? Know what your customers prefer. [Click To Tweet]. Use the best technology. [Click To Tweet]. Keep an eye on your environment. [Click To Tweet]. What do my customers prefer best? Video or text or audio? I put up a post with a video, which is also audio and transcribed. I will get just an estimate, average sort of numbers here, somewhere around 1,500 to 2,000 views. There’ll be about 700 to 1,200 video views, ’cause not everyone will play the video. And there’ll be about 2,000 to 3,000 audio listens because it’s getting pushed out to people’s devices on iTunes and Stitcher. So they don’t have to go to the post. So the views and the listens don’t correlate. But what’s the moral of the story? By the way, I’ve got about 200 to 500 downloads of the transcription. I’m sure a lot of people are reading it and not getting the transcription ’cause I put the whole thing on the post, which still blows me away. People will still get the PDF version instead of just the text version and cut and paste into Evernote. Aside from that, I’m going to get the most audio listens and I’m going to get the most video views and then PDF transcription downloads. So I suspect if I could only have one media, it would be audio because people find that pretty easy to consume and it gets you onto devices. That’s probably the biggest thing in its favor is it pushes automatically to people’s devices if they’re subscribed. It’s also easy for me to talk. I’d rather talk than type, as I know you would Martin. And using the dictation feature on our computers here, it’s pretty easy to generate some texts that’s conversational. So if you don’t like to talk and you’re shy, and you don’t want to go on camera, just talk into your computer and have it typed out and post texts. If you do good text, you can still cut through. There’s guys out there and girls doing good text blogs that get great traction. I know these people love to write. I could name a couple of people who only do texts for the most part and do it really, really well and get results. And there’s people who only do video and then there’s people who only do audio. I find by mixing it up a bit, I’m pretty accessible for most people. And it’s no skin off my back to do a video or an audio, or a text, or an infographic, or the whole lot, the whole enchilada. It’s pretty easy to do all of those modalities these days. There’s no reason technologically why you couldn’t do it. You really only need an Apple computer these days and you can generate all of these things easily. But I’d say my audience are dominantly audio-driven. But then you’ve got to factor other things. Video is going to increase trust because they can see you. They can see if you look shady or if you’re squinting or looking away or fidgety. They can make judgements around your surroundings. So always pay attention to that. Have you ever seen a video where some person is sitting in a computer desk who just looks like a bomb hit it? It has cheap furniture and scrappy papers everywhere. That’s not someone you would want to do business with. So keep an eye on your environment. Have good backdrops or settings. See if you can adjust your lighting. Pony up for a C920 camera with a USB port – that Logitech is going to get you a much better definition. And or use an iPad mini or something with a reasonable resolution and some basic editing. So if you’re going to do a media type, just be pretty good at it. It’s not hard to get to a good level using the resources in our community. And I also think that podcasts buyers tend to be represented very strongly in my top buyers’ lists. Almost everyone I ask at my SilverCircle day prior to the SuperFastBusiness Live, almost all of them found me through a podcast, which is amazing. And a lot of them through guest podcasts in the beginning. I tend to agree with you about audio. Video could be king, but I find with audio, I take the content everywhere, and end up going back to load more. Great post!